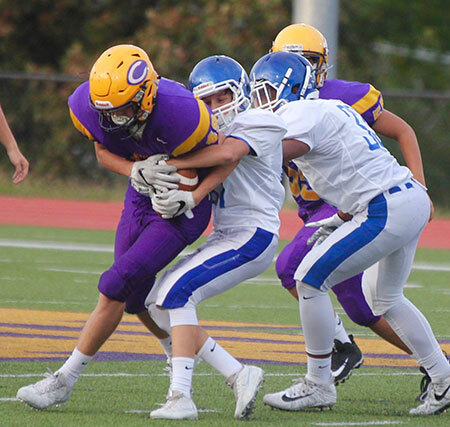 LITTLE ROCK — The Bryant Hornets freshman team ran nine plays on offense in the first quarter of their Central Arkansas Junior High Conference game against the Catholic Rockets Thursday night. They averaged over 23 yards per play and that included an incomplete pass and a 1-yard run. That run was one of four touchdowns they scored out of those nine plays as the Hornets built a 28-0 lead on the way to a 43-14 romp. Quarterback Austin Ledbetter threw for four touchdowns out of his five completions in the game. The fifth completion helped set up a score. The defense got in on the act, as well, when Hart Penfield intercepted a pass and ran it 29 yards for a touchdown on the first play of the second quarter. Most of the second half was played under the Sportsmanship (or Mercy) Rule with a running clock. Bryant ran just 24 plays on offense in the game and accumulated 315 yards of offense. Catholic managed 162 yards on nearly twice as many snaps while the Hornets’ coaches were subbing liberally in the second half. Besides Penfield’s pick-6, the Hornets forced a pair of turnovers on fumbles. At 5-0 overall in conference play and 6-0 overall, the Hornets retained sole possession of first place. 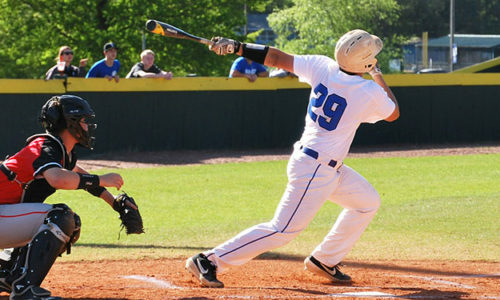 They host Russellville next Thursday. 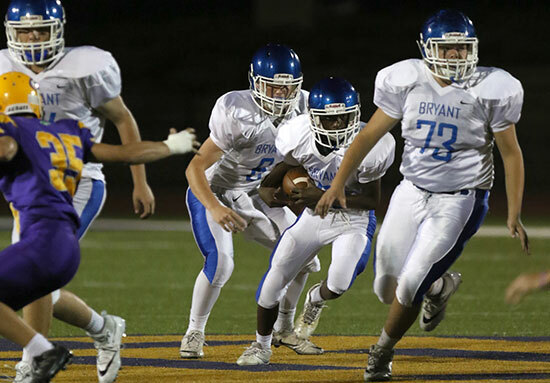 It was the 23rd consecutive win for Bryant freshman teams dating back to the third week of the 2015 season. The Hornets scored on the first play of the game. Thanks to a nice return on the opening kickoff by River Gregory, they started at their own 49. 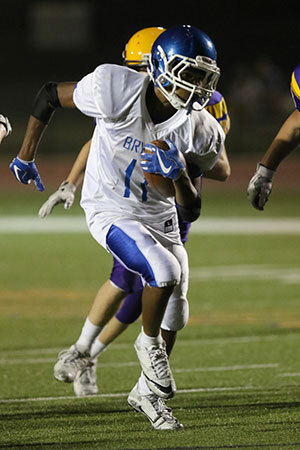 Gregory then got behind the Rockets’ defense for a 51-yard touchdown pass from Ledbetter. Brock Funk, who was perfect on five extra points. A sixth was undermined by a bad snap but Penfield turned it into a two-point conversion by avoiding the Rockets’ rush and firing a pass to Gregory. 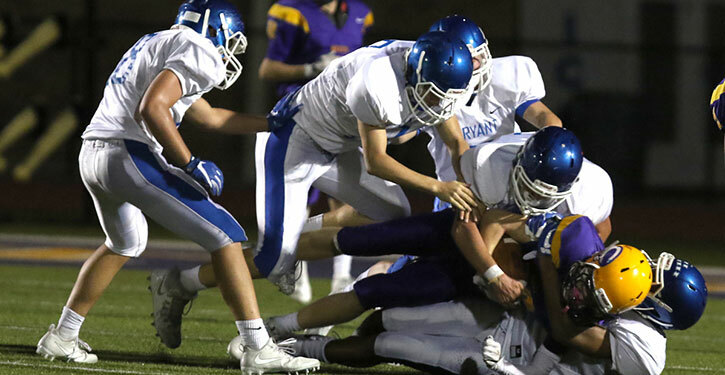 Catholic’s first possession started at its 19 but the Rockets drove to the Bryant 37 behind the running of Jackson Daniel and quarterback Will Bowman. On a first down, however, Daniel was dropped for a loss of 6 yards by Penfield with help from his teammates. The Rockets couldn’t overcome that. Eventually, a pass into the flat from Bowman to Daniel didn’t get enough to convert a fourth-and-13 and the Hornets took over on downs. After Ledbetter’s lone incomplete pass, Myles Aldridge sliced through the Catholic defense for 36 yards. On the next play, Ledbetter found Aiden Adams for a 31-yard touchdown. The first Rockets turnover led to Bryant’s third TD. 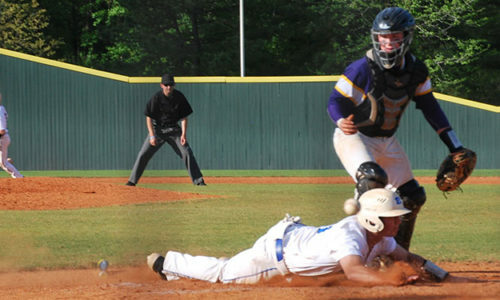 Daniel fumbled as he was dropped for a 7-yard loss and Bryant’s Brayden Godwin recovered. From the Catholic 29, Ledbetter tossed a touchdown pass to Gregory and it was 21-0. The defense held the Rockets without a first down and forced the first punt. The Hornets regained possession at their own 35 and swiftly drove for another score. Ledbetter’s only pass that wasn’t for a touchdown opened the drive, a 22-yard completion to Adams. Aldridge rumbled 27 yards to the 16 then Ledbetter kept to the 1. From there, Xavier Foote scored in the final seconds of the first quarter. 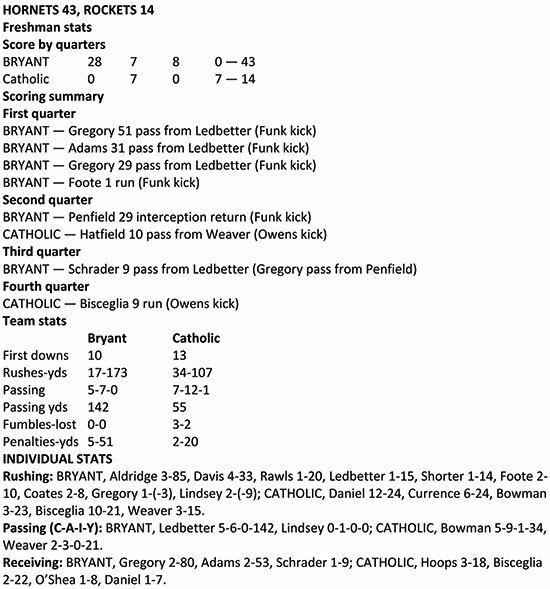 After Penfield’s touchdown return, the teams traded punts as the reserves started filtering in for Bryant. The Rockets broke the “goose egg” with a 65-yard drive in 13 plays. Along the way, they had to overcome three lost-yardage plays, two on tackles by Jimyle Harris, one with the help of Godwin. Baker Gray made a stop for a loss as well. The Hornets made a bid for a goal-line stand. Catholic had a first-and-goal at the 6 before Harris’ second stop for a loss. Logan Weaver, in the game at quarterback for the Rockets was stopped for no game, setting up a third-and-goal at the 10. Weaver threw to the end zone near the left boundary and receiver Hank Hatfield went down to dig it out and the catch was credited for the touchdown. An extra point by Paul Owens made it 35-7 at the half. The Rockets got the ball to start the second half and, again, gave it up. 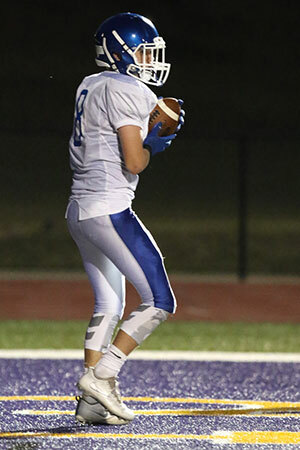 After picking up a first down on a Bowman pass to tight end Hayden Hoops, Bowman was separated from the football and Bryant’s Joseph Young recovered. In three plays, the Hornets were in the end zone again. Foote dashed for 9 yards then Aldridge rumbled for 22 yards to the 9. On first-and-goal, Ledbetter fired a pass over the middle that Hayden Schrader hauled in for the TD. The two-point conversion made it 43-7. With the clock running, Catholic used up the rest of the third and good portion of the fourth driving to another touchdown. Behind the running of Jack Currence and Brandon Bisceglia, the Rockets went 66 yards in 10 plays. A pass interference penalty contributed to the drive. Bisceglia eventually scored from 9 yards out. 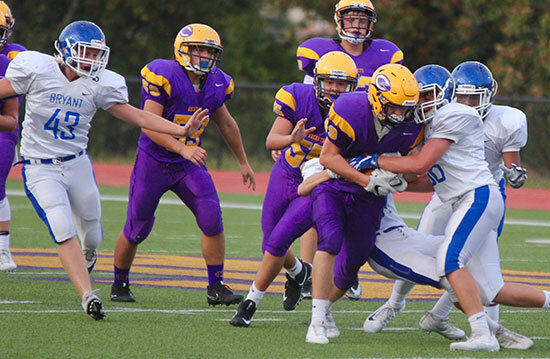 The Hornets ran out the rest of the clock driving from their own 40 to the Catholic 1 where quarterback Jackson Lindsey took a knew a couple of times to finish it.